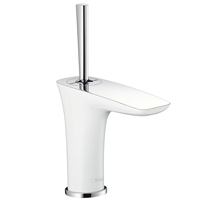 A tap full of sensuality and purity, this is Hansgrohe PuraVida. The combination of award-winning sculptural appearance, innovative, environmentally friendly technology and fine materials make PuraVida mixer bring a new design dimension to your bathroom. Hansgrohe PuraVida basin mixer, shower mixer, bidet mixer impress with their surface in white/chrome supporting the beauty of its shapes. The joystick control is another eye-catcher of the Hansgrohe PuraVida taps making Hansgrohe PuraVida mixer very user-friendly. Hansgrohe PuraVida taps are not only convincing visually but also functionally along the line, because PuraVida mixer save water and energy thanks to their most modern EcoSmart function. Let yourself be bewitched by the new Hansgrohe PuraVida mixer tap and its unique design and set new accents in your bathroom.